Keyaki Weekend Buffet Lunch, originally uploaded by Camemberu. I was surprised to hear that upscale Keyaki was offering a buffet lunch on weekends (S$58+++). Sixty a la carte dishes to choose from, including a single serve of sashimi and baby lobster (with wasabi mayo). Wary as I am of the quality of food at buffets, I thought Keyaki would maintain a certain standard, and this would be a great opportunity to sample a broad variety of their menu capabilities. I should have known better. The sashimi was a pretty but miniscule clump. Most of it too cold and chewy. The maguro was bizarrely dark red, almost mahogany. Didn't help that I had just read about carbon monoxide preservation of tuna to make them look "super red and fresh". The baby lobster was all right. Soft shell crab came a bit cold. In fact, most of the dishes (with the exception of tempura and teppanyaki) came pre-prepared, and tasted like they had been sitting there awhile. Tempura was well-fried but the prawn one tasted a little dull and pasty in some parts. Perhaps not too fresh. I liked the chicken teppanyaki with garlic chips. Unazu (vinegared eel) was also something new for me, as was the (cold) scallops with miso paste (too sweet). Tebasaki (chicken wings) was unimpressive. The highlight was the dessert - even though they only had fruit and ice cream. Rum & raisin paired well with coffee, while vanilla and lime sherbet delivered sweet memories of childhood lollies. Service was quite prompt and friendly on the whole (lots of waitstaff!). One (probably new) waiter spilt my green tea while refilling it and was terribly apologetic. They made a big fuss cleaning up and making sure I was okay, but in the end still forgot to give me my green tea. 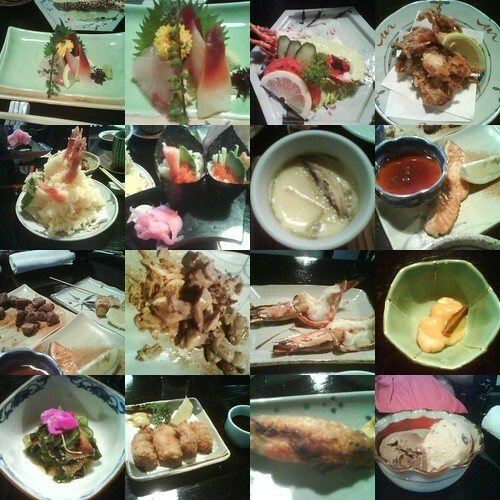 Sure, you could eat a lot, even try everything from the whole menu since portions are bite-size and kaiseki tiny. But very few items, if at all, had any wow factor. I am glad I tried Keyaki finally, but on hindsight, I would have gladly spent the same amount of money at Aburiya instead.